"Com." stands for Competitive Density. This number represents how many advertisers compete for this particular keyword in paid search. The higher this number gets to 1.00, the harder it is to rank for. The difference between Competitive Density and Keyword Difficulty is that Competitive Density measures paid competition (PPC), while Keyword Difficulty measures difficulty of ranking organically (SEO). 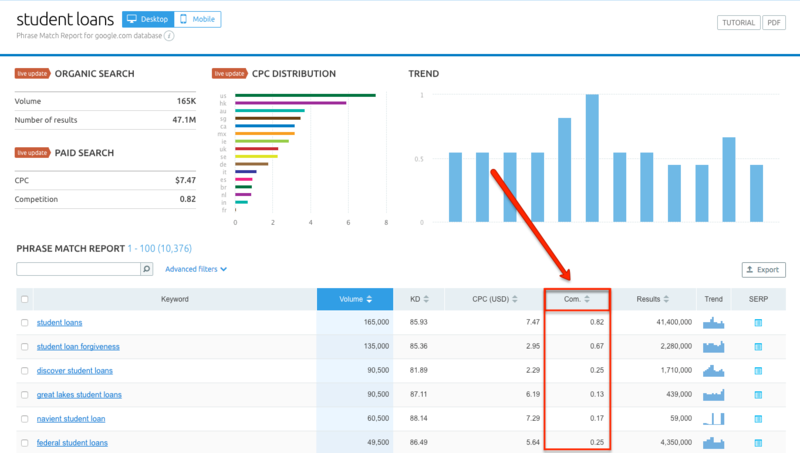 When researching keywords on SEMrush, you'll be able to compare both metrics to estimate if the keyword would be an easier target through organic or paid marketing efforts. One question you are probably asking is “What number should I stop at?” This is a question where it ultimately depends on what you are already ranking for and what you have already done through your SEO efforts. First, you will want to look at your own domain in SEMrush and analyze your keywords. This will tell you the difficulty for the keywords you already rank for and give you a better understanding of what range you want to calibrate for your keyword research.